Bill Murray, Dan Aykroyd, Harold Ramis and Sigourney Weaver star in this hit 1984 comedy about a motley team of paranormal investigators who make big bucks by ridding NYC residents of their ghosts, spooks and specters. Murray plays Dr. Peter Venkman, a university psychology researcher who spends as much of his time “testing” his female students as he does dabbling in para-psychology. 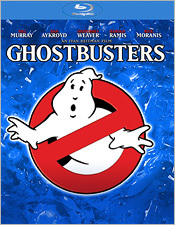 When he and his partners, Doctors Ray Stantz (Aykroyd) and Egon Spengler (Ramis), get booted from their university gravy train, they decide to use their newly-developed ghost-hunting equipment to go into business as professional Ghostbusters (“We’re ready to believe you,” their TVs ads say). Enter one Dana Barrett (Weaver), an upscale New York musician whose apartment is becoming the epicenter of spook central, who quickly leads the Ghostbusters onto BIG things... you know, cosmically speaking. Murray, Aykroyd and Ramis are absolutely in their element here, delivering a constant stream of glib one-liners and funny, off-hand comments. Aykroyd and Ramis, who also wrote the script, set Murray up time and again for perfect punchlines. And sight gags and physical humor abound here – just try not to laugh as Murray tries to wipe ectoplasm off his hand... and ends up flicking it in his eye. Rick Moranis even manages to pull off a very funny subplot, as Mrs. Barrett’s geeky, health-conscious neighbor who gets possessed by the spirit of the “Keymaster” and runs around looking for the mysterious “Gatekeeper”. This is just great stuff - absolutely classic big-screen comedy. In terms of image quality, I was quite pleased by Sony’s new 1080p presentation. Due to the varying shelf-life of the film stocks used in the early 80s, a number of films from that period have suffered from significant image problems. Thankfully, Sony’s work here is top-notch. Let’s make no mistake: You’re going to see film grain here and it’s sometimes more than light, but overall image detail and contrast rarely suffers for it. Color saturation and accuracy is quite good. This can’t be called reference quality to be sure, but I’ve seen this film in recent theatrical projection, and for my dime this is as good as I’ve ever seen the film looking. The audio has also been upgraded to 5.1 Dolby TrueHD lossless, and the quality is about on part with the picture. Clarity is much improved, with excellent LFE, but the film’s dialogue and some of the audio effects tend to sound very front-and-center – more flat and lacking in that smooth, natural ambience that newer film mixes posses. Still, when the action heats up, the surrounds become very lively (listen to the electric-hum proton packs being turned on, for example) and the film’s score is wonderfully full and balanced. While not perfect, the overall A/V quality here marks a very nice improvement over standard DVD. As for the extras, there’s good news, more good news and some bad news. The good news is that most of the video-based extras from the original DVD release have been carried over to Blu-ray, including all of the previous SD featurettes, the deleted scenes and the storyboard comparison videos. The previous audio commentary (featuring director Ivan Reitman, Ramis and producer Joe Medjuck) is also included here, though the MST3K video component of it isn’t. You probably won’t really miss that, even though the feature WAS groundbreaking for its day. The more good news is that Sony has created new bonus material exclusively for this Blu-ray edition, including the terrific Slimer Mode PiP viewing option (which features TONS of new interview clips, behind-the-scenes video and bits of graphic/text trivia), a new HD featurette on the restoration of the Ecto-1, a gallery of Ecto-1 photos and a look at the forthcoming Ghostbusters video game. (I have to confess, it looks pretty cool. I’m clearly going to have to give the Xbox 360 version a try.) There will also be new BD-Live options (including CineChat and more), though none of the online functionality has yet been activated at the time of this writing. But here’s the bad news: Much good content from the original DVD release has simply been left behind here, including the terrific Don Shay production notes text track and all of the previous image gallery material – all the production photos, all the conceptual artwork and all of the storyboard/script sequences. As is Sony’s current practice, the original theatrical trailer for this film is also missing (to be fair, there wasn’t one on the DVD version, though the previous Ghostbusters 2 DVD did have trailers for both films). Naturally, you DO get promotional trailers for other Sony Blu-ray titles. This continues to be ENORMOUSLY frustrating. It means those of you who love the film and already own the previous DVD have a tough choice to make: Keep both discs, or sell the DVD and lose good content. There is no technical reason why this material couldn’t have been included – image galleries and text tracks take up almost NO space on a BD disc. This is a decision driven by marketing people, who no doubt looked at all the previous bonus material, and then looked at their marketing research and came to the conclusion that “people just don’t care about image galleries and trailers” so just leave them off. What these people at Sony CONTINUE TO FAIL TO GRASP is that fans and collectors, who are the core audience for these catalog Blu-ray upgrades, DO care about such things. They DO care about trailers and galleries. They actually enjoy such things! They want everything from the previous DVD to carry over to Blu-ray, so they can sell the DVDs to help offset the BD upgrade cost and to save shelf space. And the fact that Sony continues to make this mistake tells me that the people making these decisions in home video there just don’t fully understand their best customers – the serious film enthusiasts and collectors. When just about every other major studio in town has figured these things out with their catalog Blu-ray upgrades, yet Sony continues to omit trailers and drop good DVD extras, that’s the only conclusion I can draw. Somebody there just doesn’t GET IT. And no, making this stuff available for download via BD-Live won’t cut it, guys. Put it on the disc. In any case... I don’t think I’ve ever laughed harder in a movie theatre than I did back in ‘84, when I first saw Ghostbusters. The new Blu-ray version is generally very good, but a few omissions from the previously available DVD extras are likely to prove a frustration for fans and collectors, and prevent the Blu-ray from being called truly great, which is too bad. Still, the improvements in video and audio quality here are very welcome, and the new bonus material (created exclusively for Blu-ray) is quite good. On the whole, the Blu-ray upgrade is still recommended... but at the right price.